Leviathan by Scott Westerfeld. Illustrated by Keith Thompson. Simon Pulse, Simon & Schuster Children's Publishing. Publication Date October 2009. Reviewed from ARC from BEA. The Plot: Prince Aleksander, 15, is the only child of Archduke Franz Ferdinand and his wife, Sophie. He is awaken in the middle of the night and flees the palace; his parents have been murdered and, while he is not a direct heir, his life is in danger. Alek is a "clanker" -- part of the world that is all about machines. Deryn Sharp, also 15, is pretending to be a boy named Dylan to get a chance to fly with the British Air Service. But she's not learning how to fly machines. Deryn is a "Darwinist" -- the part of the world that has created living creatures to fly, to use for messages, as pets. The assassination of Alek's parents starts a World War. As Alek runs for his life, and Deryn finds danger and adventure on the flying living ship Leviathan, their paths grow closer and closer. The Good: If you know what "steampunk" is, skip forward in the review. If you don't, here it is, quickly: alternate universe science fiction, set in the past, with fantastical machines; a glorified Victorian age, as it were. OK, yes, I'm sure others have better explanations but that is my quick one. 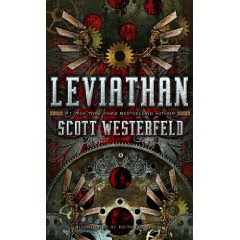 The ARC of Leviathan provides a definition; and while it may just be there for reviewers like me, I hope it stays for readers who may not have heard of "steampunk" and just need that brief explanation. From the ARC: "Steampunk is a genre of science fiction set in an era or world where steam power is still widely used -- usually the nineteenth century, and often set in Victorian-era England -- but with prominent elements of either science fiction or fantasy, such as fictional technological inventions." I know what steampunk is; but I haven't really read much of it. For someone like me -- so, I assume, many kids and teens -- this works as a great introduction into steampunk. And if you want to recommend some other steampunk titles to me, please do so. Westerfeld uses two types of technological inventions. In the Austro-Hungary Empire/Germany, it's about mechanics and machines, all more developed and different from what was in our timeline. For example, instead of tanks with tractor treads there are "walkers", fortified tank-like structures that "walk". In the British Empire and France, instead of mechanical technology, it's scientific technology, with Darwin not being the father of evolution but the father of DNA manipulation, the creation of entirely new creatures for things such as flying airships and messenger lizards and attack bats. One can quickly see that philosophy is involved here, also; on the one side, making with ones hands versus the other, which is playing with life. What also works well is Thompson's illustrations. Both the clankers and Darwinists have machines and creatures we've never heard of; instead of Westerfeld wasting words with trying to describe them (and losing people like me who would be all "um. ok. let's skip to action and dialogue, ok?") we get to actually see what these machines look like (OH, we think, that's how big it is, there are the turrets, that is how it works). Alek may be a Prince; he may be rich; but right now he's a teenager on the run, and because his father married someone beneath him, Alek cannot inherit. That doesn't mean Alek is ignored after his father's death. Far from it, which is why right now he's adjusting to life on the run without servants. Alek is always sympathetic, even as he does impulsive things. With Alek, we are hunted, staying one step ahead of bigger ships, plunging through forests in a sweaty, noisy walker. Meanwhile, Deryn is full of adventures, trying so hard to be the boy she pretends to be. She embraces it, charging into danger, having to be the best. We are flying in the sky, enjoying the freedoms, trying not to let it slip that she's a girl, thrilling to battles with aeroplanes. Alek and Deryn are on two distinct adventures; the reader knows that ultimately they will overlap, because hello, we cannot have two heroes in one book who never meet! It's not till the book is halfway through that we get that meet and greet; before then, we get to know and sympathize with two very different people (and look forward to the meeting.) And yes, the meeting is everything a reader wants. By that point, we are cheering both teens, sympathize with both the clankers and the Darwinists, and wonder how the heck two such opposites can get along. Westerfeld's end note explains some of the historical changes in this alternate history; for example, that Franz Ferdinand and Sophie didn't leave behind a fifteen year old son named Aleksander. They did leave behind three young children, Sophie, Maximilian, and Ernst; and according to Wikipedia, in the 1930s they were living in Austria, opposed the Nazis, and ended up in Dachau. I cannot find much more than that online; except all three survived. If anyone can recommend a book that covers this in more detail, I'd appreciate it. A great adventure pick; and a great book for science fiction readers who don't want fantasy (i.e., unicorns and elves), thank you very much. If a dragon shows up here, it's going to be man-made and engineered. This is book for younger teens; but older teens will enjoy it, also. Why younger teens? Easy. When a teenage girl is pretending to be a boy and never worries about her period? It's a book that is being marketed to the younger set. "When a teenage girl is pretending to be a boy and never worries about her period?" And THAT is one of the many reasons that Bloody Jack was so awesome. I also wonder about girls who want to do what Deryn/Dylan/Jack do but have shapes and figures that no amount of binding or clothing can hide. But that's another post. re: other steampunk recommendations, I don't know if you've read Philip Reeve's Mortal Engines quartet (Fevre Crumb, a prequel, was published this summer)? Brilliant steampunk YA about moving predatory cities. It's not really steampunk, since it's set in the future, but Neil Stephenson's "The Diamond Age" is largely about neo-Victorians. It's one of my favorites. I have only read the first one, but I fully intend on reading them all! I will definitely try Leviathan after your review. Thanks! I had no plans to read Leviatian but than I read this review. There are too many great MG/YA books coming out. I can't keep up. Now I am trying to think of a book where a girl pretends to be a boy and worries about her period. I can't. Steam punk. I'd heard that word. Now I have a better idea what it means. Thanks, Georgia! Leviathan sounds like a wild action adventure. Anytime a prince flees for his life in the night-time it's usually a sign of exciting things to come (at least in fiction :).) I'll have to read it. Un Lun Dun by Mieville and the Flora Segunda books by Wilce are awesome steampunkesque YA books. I'm super excited for Leviathan! Reading the book, "How can you be sixteen and worry about NONE of that?" I looked ahead a lot, anxious to see when they would finally meet up. And I was hoping they'd like... fall in love. *guilt* but that's complicated when one thinks the other is a boy. Anyways, it was a great read. I can't wait for the next one! and I know I've read at least one book where the guy wasn't happy to find out the guy he liked was really a girl. cannot think the title... and I know there is a BlackAdder episode that mocks this convention, because the girl dressed as boy is wearing form fitting clothes, is clearly a girl, and all the others just humor her. LOL I love your last line! I saw Scott Westerfeld do a presentation on Leviathan last week. He was fascinating, he made me not only want to read Leviathan straight away but find out more about WW! and Darwin's theories. The pictures look amazing but more amazing were the photos/sketches that inspired them!